Today, commercial document shredding is a practice that several companies across New Jersey and the rest of the U.S have implemented. With privacy regulations becoming more and more stringent, proper disposal of sensitive material is crucial in protecting your business, customers, and employees from harm. The legal risks associated with tossing confidential paper in the trash, range from exposing employee information, private documents to competitors, to identity theft or fraud. None of these situations are pleasant ones. What are You Currently Doing for Shredding? Often smaller companies will assign their employees to look after the task of paper shredding, using a small office shredder. Normally this option is decided upon because it’s seen as the easier and cheaper solution; however, once all aspects are considered the opposite is true. • Paper Shredding can be very tedious and also very time consuming (see our blog on high volume shredding). When you’re taking this task on yourself, there’s also the need to remove staples and any other clips, because portable shred machines aren’t designed to handle these and will jam otherwise. Endless hours spent next to an office shredder takes away from employee productivity; after all, your employees should be focusing on job duties they were hired to do. • Portable shredding machines can be very distracting due to how noisy they are when operating. A disruptive working environment like this can make focusing on day to day tasks very difficult. Your employees need to be able to concentrate; the distraction of a shredding machine is one that can be avoided. • There is no way to know for certain that your sensitive documents will in fact be destroyed by the employee who is to handle it. It’s pretty easy to forget about these things, and documents will slipthrough the cracks if you have not implemented a regular, monitored shredding schedule. Often employees get “lazy” and wind up tossing old documents into the garbage or recycling bin because it’s an easier (and quicker) option. • A commercial document shredding company can offer the same service in a fraction of the time it takes to do in-house. A mobile shredding truck will shred through staples, elastics or paper clips. When you outsource your paper shredding, your internal resources are freed up, and employees can concentrate solely on their job duties, contributing to company growth and success. • Forget having to organize old papers into filing boxes or continuously feeding documents through a machine. Secure and lockable shred bins are given to you for ongoing paper collection prior to shredding. Your content will remain entirely safe until capacity is reached and bins require emptying. At this point, a shredding specialist will arrive on-site at your location to perform the paper shredding process for you. • Security threats are considerably reduced, as the procedure is completed by highly trained professionals only. 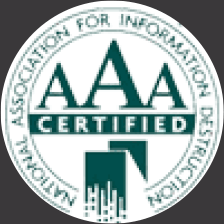 Plus, after the commercial document shredding is complete you will be issued a Certification of Destruction; documented proof that your information has been destroyed in a manner that is 100% secure. When you consider the time and expenses associated with shredding in-house, it’s definitely in your best interest to outsource your commercial document shredding needs. Most businesses in New Jersey at some point will need to rid of old marketing material. If you have old promotional product taking up storage, or product that has been recalled and does not meet company regulations, our secure product destruction services may be of interest to you! 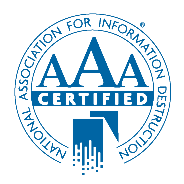 At IntelliShred our process is entirely secure and compliant with both state and federal privacy regulations. IntelliShred will destroy your paper storage accessories and other promotional material at our facility, in a quick and environmentally-friendly approach. So in what situations will a typical Newark company require secure product destruction services? While this will change depending on your specific industry, usually a business will turn to product destruction solutions if they are faced with a product that’s deemed defective, one containing high lead content, or if material could be a safety threat to your business or customers. Tossing unwanted or defective product into the garbage may seem like an easy solution; however, disposing of items in this negligent manner provides no protection to your company’s brand and reputation, which should always be considered with high importance. After all, as a business you work hard to succeed, promote your brand, and maintain a specific image. Carelessly tossing away old product brochures, price lists, company binders, electronic scrap and other promotional items, could pose a threat to your business if discovered by the wrong person, such as a competitor. Secure product destruction by industry specialists is the best and most reliable solution that guarantees your Newark company will be safe from such as risk. Always keep in mind that your company’s integrity, reputation and success could be on the line if you fail to destroy marketing product securely. IntelliShred based out of New Jersey, is your number one resource for professional and reliable disposal of marketing products in any quantity. We’ve been providing secure product destruction solutions for over 10 years; our team will happily pick up your products for destruction purposes, or you may drop them off at our secure facility in Newark, New Jersey. Contact us today at 1-866-747-3360 for a free quote, and more details in regards to our paper and secure product destruction services.